As per previous post, I attended HITB 2013 Amsterdam in April. I decided to do the mobile hacking course run by Blake Turrentine from HotWan, @Pod2g & @P0sixninja. Step 5 - You can unmount the developer .dmg. Step 6 - Copy the executable to the iPad (this assumes you have ssh running on the device, if you don't you need to do that first). I use usbmux to connect to my iPad via usb, but you could connect via WiFi using the IP address. Use scp to copy to Device, when prompted enter the password for the root account on your Device (iPad / iPhone). You could use cyberduck or any file transfer application you have. Step 9 - If you are using usbmuxd you will need to ensure the port you just set the debug server to listen on is being forwarded from your mac over usb to the remote port (if you are using IP add to connect to the device you don't need to worry about this). 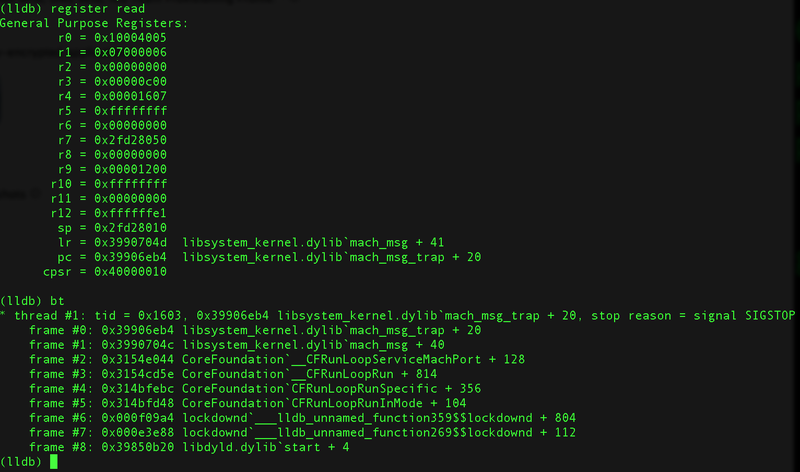 Once lldb console has started type platform select remote-ios and hit enter. The following link (http://lldb.llvm.org/lldb-gdb.html) is a gdb to lldb comparison chart that might help if you know the gdb command you want but don't know the lldb command. I need to do some more work with lldb as I have never really used it, I'm hoping this will be a useful way to look into some apps I have been wanting to reverse for a little while. 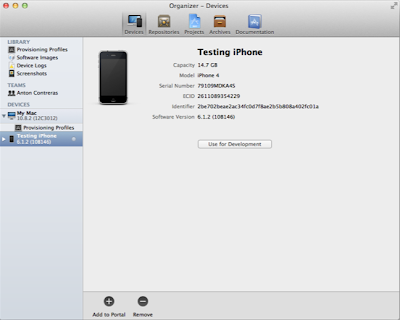 Is the device configured for development in xcode organiser? 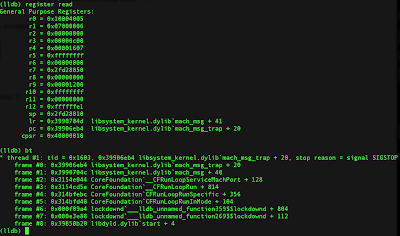 do you also go on ios kernel debug? I can't connect the kernel via lldb, always fail, any suggestion?